As much as the Halloween franchise has been dragged around over the years, with too many bad sequels and reboots to keep track of, there's a simple magic to John Carpenter's original film, with Michael Myers stalking Jamie Lee Curtis and everything at its basics. 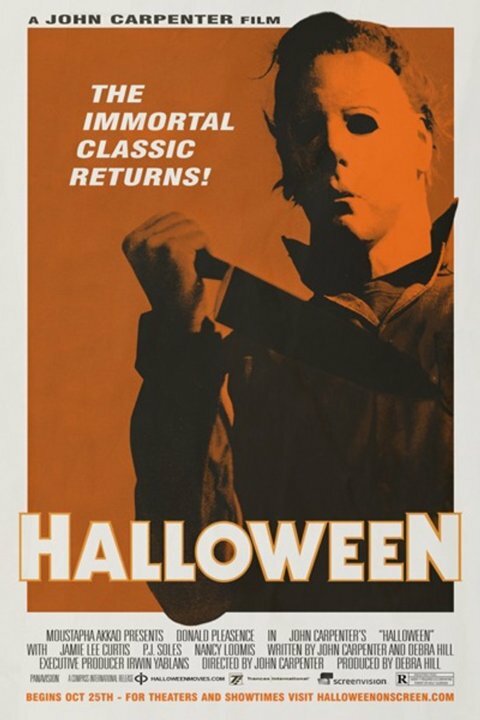 And now moviegoers who weren't around for the original 1978 release will have their chance to experience the horror on the big screen for themselves-- Halloween is returning to theaters, and appropriately enough, it'll be coming back in time for the October holiday, with an October 25 release. If you visit the Halloween On Screen website like the poster tells you, you can find a list of the theaters where Halloween will be making its return. It'll be showing up in most states in the U.S., which means plenty of people will find a way to scare themselves silly before the big holiday on the 31st. Halloween, of course, is only part of a giant recent trend of theatrically re-releasing classics from the past, from Back to the Future a few years ago to the 3D treatment of the Star Wars prequels to last week's IMAX run of Raiders of the Lost Ark. Yes, this is just a way of studios making more money off films they made ages ago. But wouldn't you rather they do it this way than allow reboots or sequels that nobody asked for? Well, in the case of Halloween I guess we've been getting all of the above, but after two Rob Zombie reboots, a return of the original might be exactly what we all need.